Photographs: 61 photographs available, of which 7 are featured on this page. SCROLL DOWN FOR PHOTOGRAPHS. 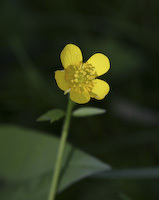 The brigth yellow flower of Hispid Buttercup. A cluster of Hispid Buttercup plants.